Southampton ended their run of five straight defeats as they comfortably beat Everton to remain in the Premier League top five. Romelu Lukaku headed into his own net in the first half, moments after Shane Long had a penalty appeal rejected. Ross Barkley's 20-yard first-half shot for the visitors was the only effort on target from either side after an hour. But Graziano Pelle doubled the hosts' lead from close range before Maya Yoshida headed in to seal the win. It was Pelle's 11th goal of the season as the Saints made light of the absence of several key players to get back to winning ways in emphatic style after six matches without a victory in all competitions. Everton were disappointing for the majority and only troubled goalkeeper Fraser Forster in the last few seconds when Lukaku shot straight at him. Southampton surprised many at the start of the season when, despite having lost five players for a total of £92m and manager Mauricio Pochettino joining Spurs, they were second in the Premier League in November. With injuries and suspensions mounting up, manager Ronald Koeman was forced to give 19-year-old midfielder Harrison Reed his first Premier League start. Ryan Seager, 18, was also on the bench for the first time, as one of four teenage substitutes. Everton may have had a mixed start to the campaign but boss Roberto Martinez still had eyes on a top-four finish, a prospect that is looking increasingly unlikely. Last season's 2-0 defeat at St Mary's at the end of April severely dented their hopes of Champions League football. Both goals were own goals that day and they were at it again as Lukaku headed James Ward-Prowse's corner into his own net for the opener. It was a deserved lead for the Saints, who went close before the break through a Pelle header before he shot into the side-netting, while Shane Long should have been awarded a penalty after being kicked in mid-air by Phil Jagielka. Pelle pounced on Long's knock-down to prod the bouncing ball home for a second after the break before Yoshida headed in his first goal since February from Steven Davis's exquisite cross. "We were outstanding. As a team, the work was unbelievable and you need that to win games. It is not always about quality. The players showed how you have to fight to win games. "If you show more spirit you are invariably more lucky. After the goal we had more belief and more confidence after losing four or five games. Hopefully we got some confidence back. "The energy Harrison Reed put in was one of the keys to win the game." "Very disappointing. A game with nothing between the two sides apart from ourselves not being able to defend the six-yard box better. "It is about how we defended the six-yard box, the other two goals were the same. They didn't have to do much to score three goals. It was not a case of them being superior to us, it is just we were very soft. "I do feel we need to find a good run of performances. I don't think the performance was too far away from what you need to get good results." 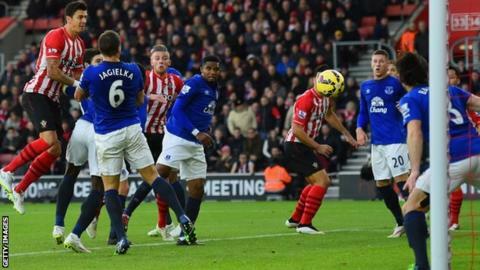 Match ends, Southampton 3, Everton 0. Second Half ends, Southampton 3, Everton 0. Attempt missed. Seamus Coleman (Everton) left footed shot from the centre of the box is too high. Attempt saved. Romelu Lukaku (Everton) left footed shot from the centre of the box is saved in the centre of the goal. Corner, Everton. Conceded by Matt Targett. Attempt missed. Steven Davis (Southampton) right footed shot from outside the box is too high. Substitution, Southampton. Dominic Gape replaces Shane Long. Attempt missed. Romelu Lukaku (Everton) header from the centre of the box misses to the right. Assisted by Leighton Baines with a cross. Foul by Ross Barkley (Everton). Harrison Reed (Southampton) wins a free kick in the defensive half. Attempt missed. Ryan Bertrand (Southampton) left footed shot from the centre of the box is close, but misses to the left. Assisted by Graziano Pellè with a headed pass. Attempt saved. Ross Barkley (Everton) left footed shot from outside the box is saved in the centre of the goal. Assisted by Seamus Coleman. Foul by Samuel Eto'o (Everton). Goal! Southampton 3, Everton 0. Maya Yoshida (Southampton) header from the centre of the box to the bottom right corner. Assisted by Steven Davis with a cross. Corner, Southampton. Conceded by Seamus Coleman. Foul by Muhamed Besic (Everton). Substitution, Southampton. Matt Targett replaces James Ward-Prowse. Hand ball by Graziano Pellè (Southampton). Corner, Everton. Conceded by Fraser Forster. Attempt saved. Romelu Lukaku (Everton) left footed shot from outside the box is saved in the top left corner. Assisted by Seamus Coleman. Attempt blocked. Steven Naismith (Everton) left footed shot from the centre of the box is blocked. Attempt missed. Muhamed Besic (Everton) right footed shot from outside the box is high and wide to the right. Attempt blocked. Ross Barkley (Everton) right footed shot from outside the box is blocked. Jose Fonte (Southampton) is shown the yellow card for a bad foul. Ross Barkley (Everton) wins a free kick in the attacking half. Foul by Jose Fonte (Southampton). Attempt missed. Nathaniel Clyne (Southampton) right footed shot from outside the box misses to the left. Assisted by James Ward-Prowse. Offside, Southampton. Ryan Bertrand tries a through ball, but Steven Davis is caught offside. Attempt saved. Jose Fonte (Southampton) header from the centre of the box is saved in the centre of the goal. Assisted by James Ward-Prowse with a cross. Muhamed Besic (Everton) is shown the yellow card for a bad foul. Harrison Reed (Southampton) wins a free kick in the attacking half. Samuel Eto'o (Everton) wins a free kick in the attacking half. Goal! Southampton 2, Everton 0. Graziano Pellè (Southampton) left footed shot from very close range to the centre of the goal. Assisted by Shane Long. Attempt blocked. Shane Long (Southampton) header from the centre of the box is blocked. Assisted by Nathaniel Clyne with a cross.